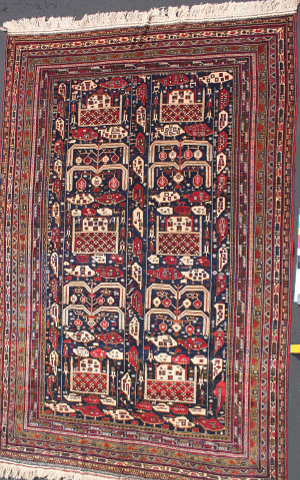 Warp (noun): 1. the longitudinal thread or yarn held in tension on a frame or loom; 2. a twist or distortion of the shape or form of something. 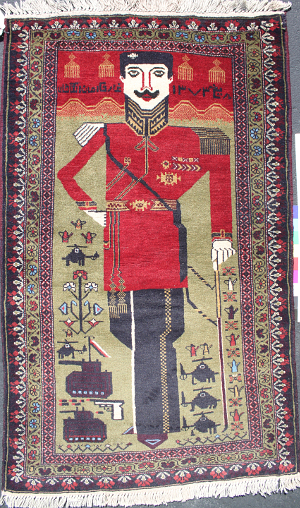 Since the Soviet invasion of Afghanistan in 1979 and continuing today, traditional Afghan rug weavers have incorporated stylized representations of political figures, Kalashnikovs, flags, maps, architectural landmarks, tanks, drones and ammunition amid colorful floral and geometric patterns; designs reflecting a reality familiar to the people of this multi-generational war-torn region. 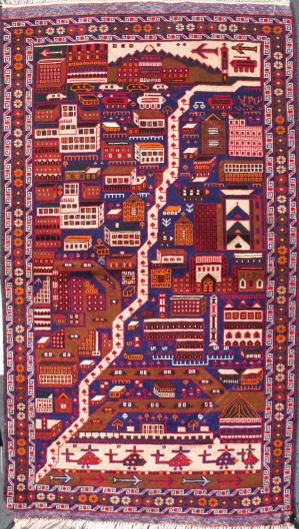 In 1971 the Italian conceptual artist Alighieri Boetti (1940-1994) began commissioning Afghan weavers to produce his now famous series of map textiles originally inspired by his collected newspaper illustrations of the Arab-Israeli Six-Day War (1967). 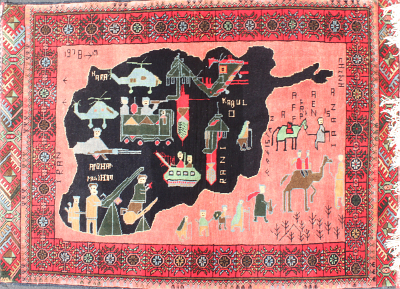 Years later, during the Soviet invasion and rise of the US-backed Mujahideen, numerous war rug artists began to reuse Boetti's visual mode in order to portray political maps of Afghanistan and neighboring regions overlain with representations of munitions, soldiers, fighter jets and historical people and events. 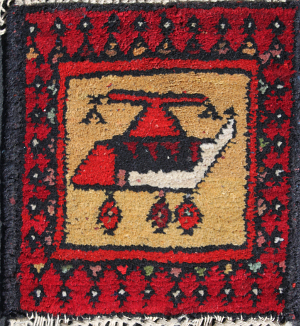 Designs from the 2000s feature collapsing World Trade Center Towers behind peace doves and conjoined US and Afghan national flags. 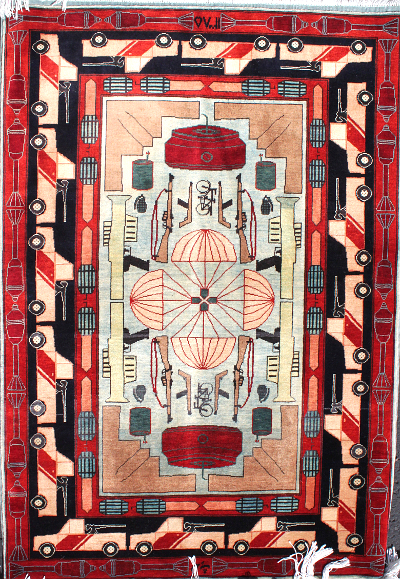 Still other rugs situate orderly rows and columns of identical tanks or guns enclosed within floral borders and encircled by decorative bands of bullets. 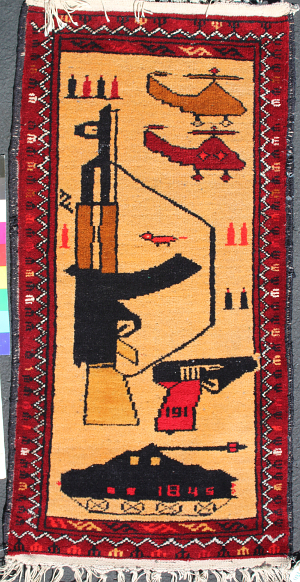 Obama-era rugs have begun to include images of a new weapon: the drone. 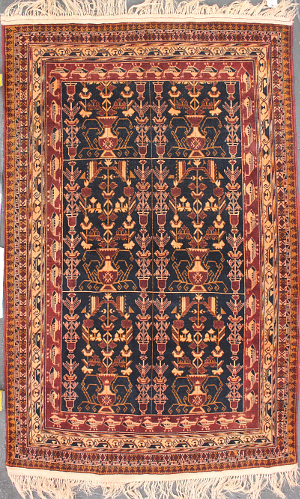 These and other iconographies are lifted from Western propaganda materials, sourced from major media outlets, and culled from personal experience. 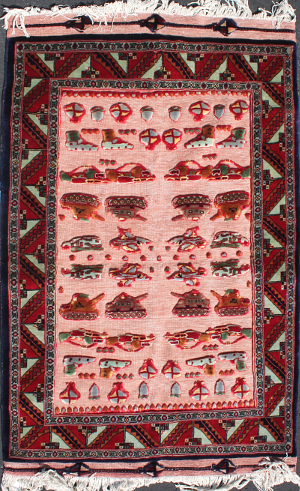 This exhibition presents a selection of rugs that simultaneously document the history of a region while standing as a complicated testament to a still viable expressive and contemporary artistic tradition impacted by unusually diverse economic and political pressures. 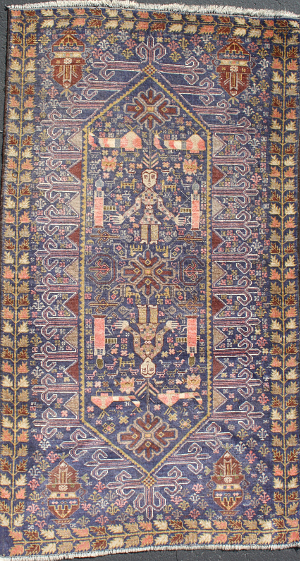 Turkmen Sumac (exhibited at Miami University Art Museum) Formerly 26.